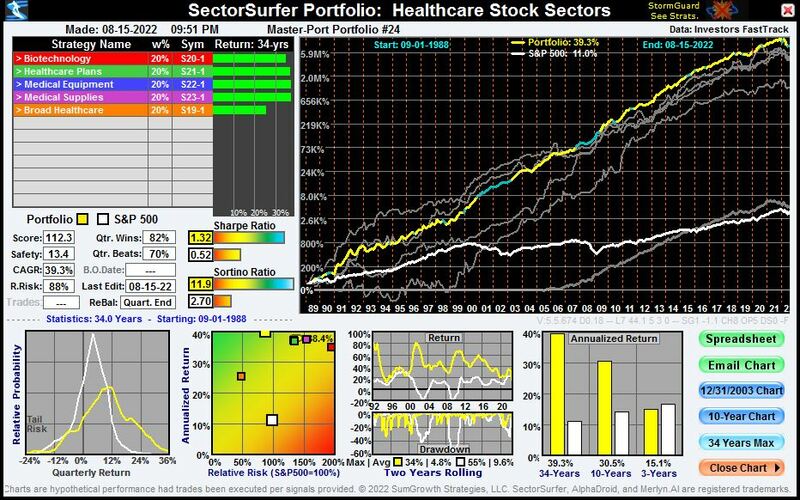 The Healthcare Sectors Stocks Portfolio holds a set of four underlying stock Strategies, each of which selects one stock for the Portfolio-of-Strategies to hold. Each of the underlying Strategies evaluates a set of candidate stocks derived from the same market sector, which helps reduce system noise and improve the probability of selecting the true trend leader. 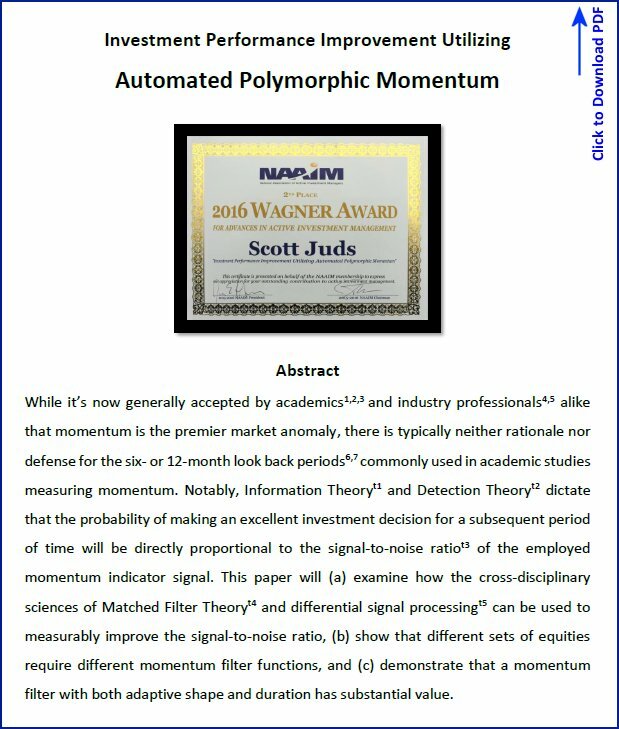 SectorSurfer optimally extracts trend signals from noisy market data utilizing the cross-disciplinary mathematics of electronic signal processing and matched filter theory, the same mathematics that enables Ethernet, Wi-Fi, and smart phones to perform so well. 1. Sector and asset class funds eliminate the risk of single-company failure while still retaining better return prospects. 2. 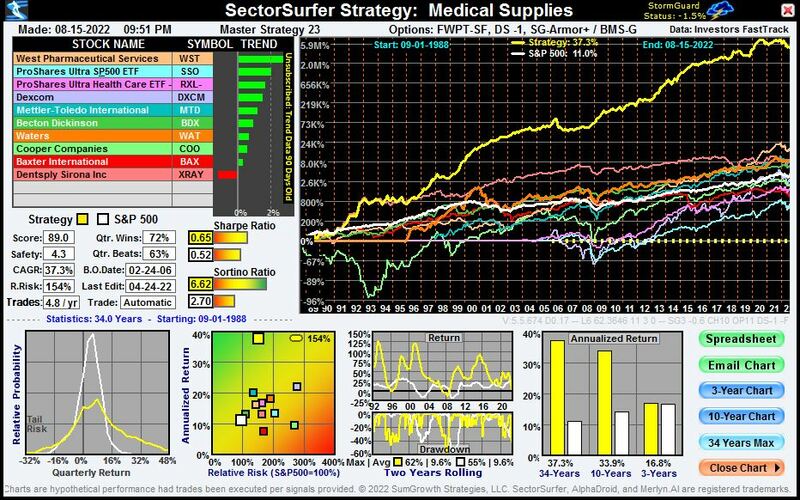 True Sector Rotation reduces risk by avoiding trend laggards, and improves returns by selecting only the trend leader. 3. 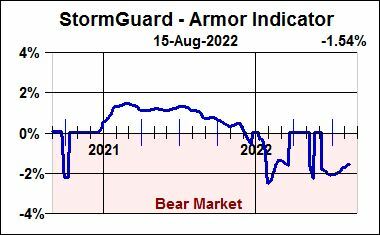 StormGuard-Armor reduces risk by exiting the market when its three components indicate that stocks are no longer safe. 4. 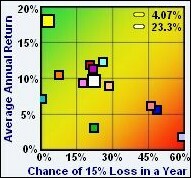 Bear Market Strategies make positive returns more likely during a market crash, reducing the risk of meeting your objectives. 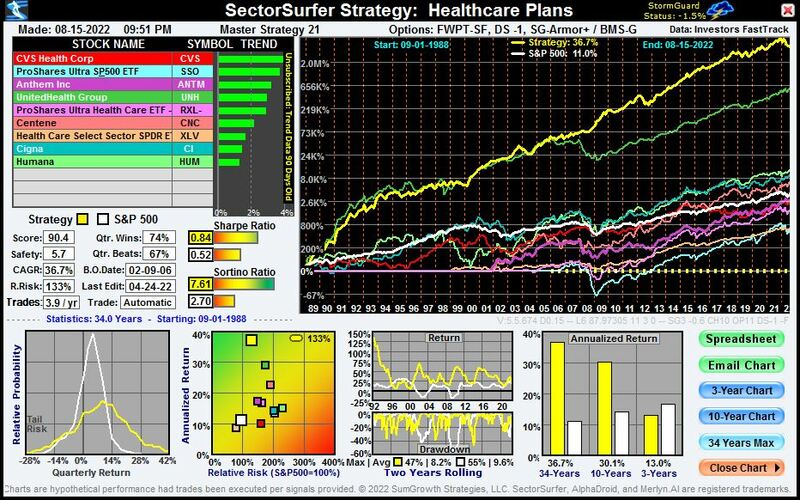 The Healthcare Sectors Portfolio (top chart) holds four Healthcare Sector Stock Strategies. Each Strategy selects the one, and only one, designated trend leader to represent the Strategy in the overall Portfolio. The Portfolio holds only those four stocks, equally weighted at 25%, and is rebalanced quarterly to the assigned allocation weights. The impressive results produced by averaging together the home-run-hitters selected by the four underlying Strategies is immediately obvious upon viewing the chart. 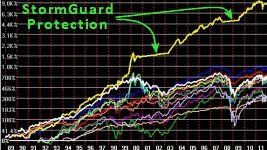 The Portfolio chart plots performance for each of the contributing strategies with the portfolio's net performance in yellow and the S&P500's performance in white. The chart performance statistics speak for themselves. 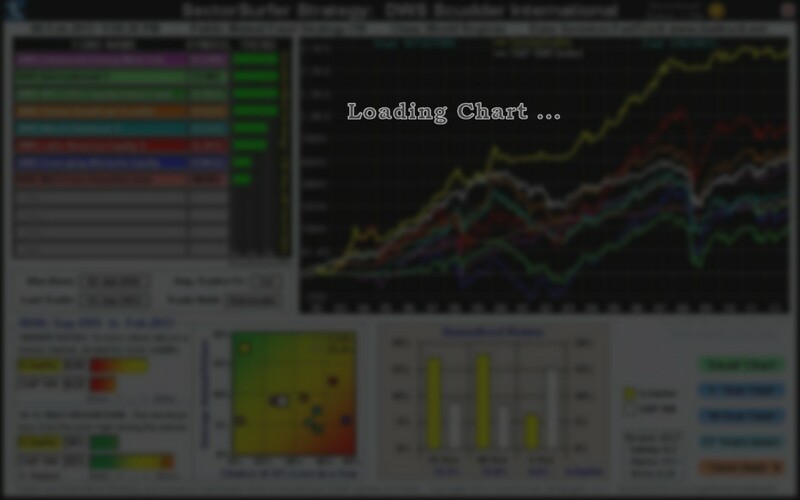 A more detailed performance data spreadsheet can be downloaded for review and analysis. Each of the four underlying stock strategies evaluate a set of ten candidate stocks determined on the basis of their participation in ETFs representing its particular market sector. The MDY, SPY or MVV index ETF is additionally included in the set to compete against the stocks as a sort of performance backstop. 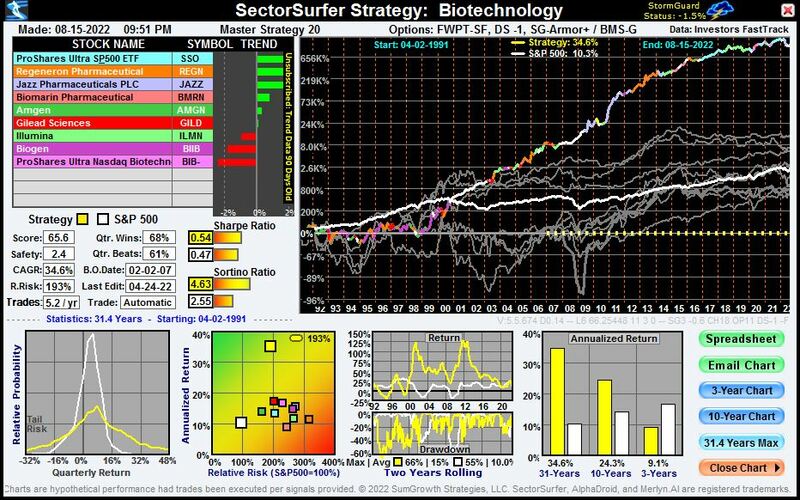 Each month SectorSurfer's algorithms determine which one, and only one, of these candidates is the current trend leader and should be owned. 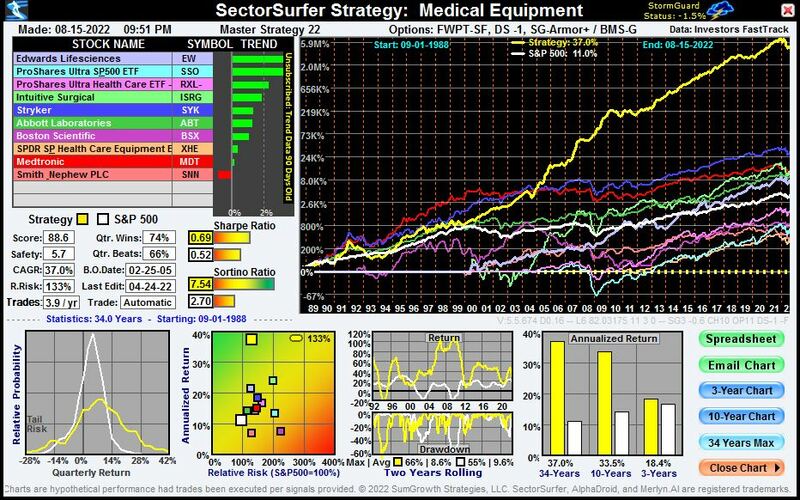 Owning only the trend leader is referred to as True Sector Rotation (or serial diversification) and is a powerful investment ally best appreciated through its performance. SectorSurfer Strategies typically produce only about four trades per year, and Forward-Walk-Progressive-Tuning, the industry gold standard for backtesting, is standard. This set of Strategies is easily imported into your own account where you can use them directly or edit them to better fit your needs. If you're interested in other fund families or ETFs, start with our Strategy Hall of Fame to view powerful Strategies built by our users. Additional background material can be found in the resource links at the bottom of this page, on the Home Page, on the Sector Rotation Theory page, and on the Advanced Topics page . SectorSurfer can put True Sector Rotation to work for you.